Reports of an unknown disease affecting maize crops in the South Rift region of Kenya appeared in September 2011. 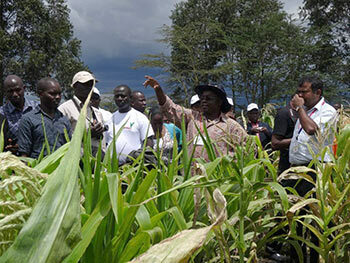 The disease was identified as maize lethal necrosis (MLN) after serological and molecular tests were carried out on infected maize plants by a scientific team from the Kenya Agricultural Research Institute (KARI) and CIMMYT, in partnership with the US Department of Agriculture and Ohio State University. During 2012, the disease was also reported in the Central and Eastern Provinces as well as in some areas of Tanzania and Uganda. In August 2012, invited by the Government of Tanzania, CIMMYT surveyed the affected regions and identified the disease as MLN. Studies undertaken jointly by CIMMYT and KARI over the past two years have confirmed the vulnerability of most pre-commercial and commercial maize germplasm to MLN under natural disease pressure as well as under artificial inoculation. More encouraging, however, was the identification of promising CIMMYT inbred lines and pre-commercial hybrids with resistance or moderate resistance to MLN, which offer considerable hope to combating the disease through breeding efforts. In September 2013, CIMMYT, in partnership with KARI, established the Maize Lethal Necrosis Screening Facility at KARI-Naivasha which will focus on tackling the deadly MLN virus. The facility aims to provide MLN phenotyping services and effectively manage the risk of MLN on maize production through screening and identifying MLN-resistant maize germplasm. The facility was made possible with funding support from the Bill & Melinda Gates Foundation and the Syngenta Foundation for Sustainable Agriculture.